Solution: stumbling upon the perfect pair of solid wood, quality, sturdy mid-century dressers--in pristine condition--while on BisManOnline. 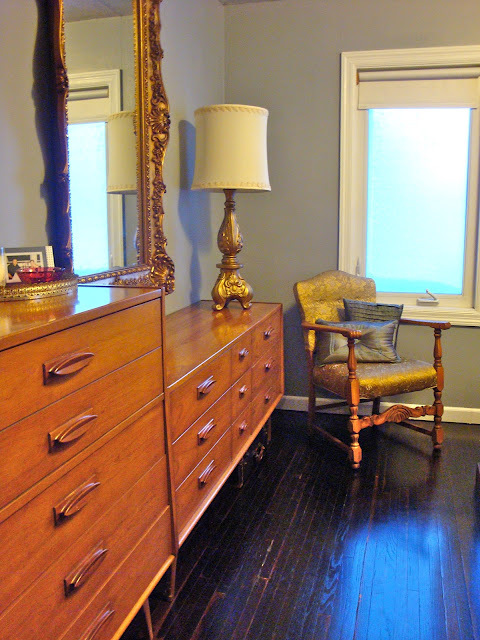 Did I mention we paid $110 for the 2 dressers and mirror--which attaches to the back of either piece. We have it on the taller one for now because the gold mirror is above the other. But now we're faced with the oddity of having two giant mirrors on that wall. I'm trying to decide which one is going to stay and which one is going to move to above the sofa in the front room when we do our upcoming rearrangement of the living and dining zones. But that's another story entirely so I'll wrap up this tangent. The sweet older couple who sold them live a short Sunday afternoon's drive away from us in Bismarck. They are selling some of the husband's mother's things after her death. The only thing he had left was her electric wheelchair and asked us if we wanted it. :) Umm, maybe later. In 50 60 70 years. Or so. And just to remind you, the photo above shows the dresser we had in here before. We love.love.love this piece--it was my great-grandparents and a gift from my uncle--so it hasn't moved far. It's new home is in the man-cave under the giant television. It's perfect for holding our DVDs and such. And I've found another reason to love March besides it being my birthday month. It's now my find-amazing-furniture-deals month. 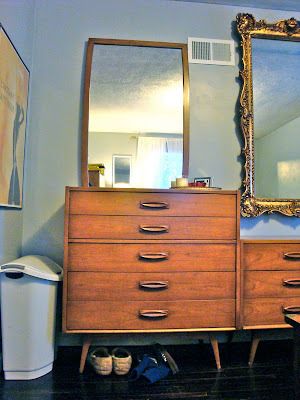 Remember the hutch I bought with a little--very little--birthday cash? Well, I've refinished it and it's looking fantastic. Pictures to come soon.